Burmester 089 review | What Hi-Fi? Over recent years an increasing number of manufacturers at all price levels have taken to include digital inputs onto their new CD players. This makes perfect sense given that every CD player already has built-in digital-to-analogue converter circuitry. If it’s a good sounding DAC, why wouldn’t you want to use it to make all your other digital music sources sound better? 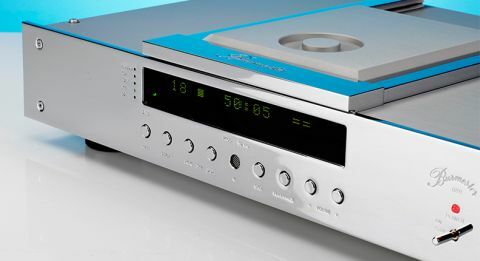 The 089 is Burmester’s high-end take on a CD player with digital inputs. There’s also an added twist in the form of an optional module called MMI (yours for an extra £1340), which adds USB and AptX Bluetooth inputs to the product. This Burmester is as much a system hub as it is a CD player, particularly when you consider it has balanced analogue inputs and variable output too. That means it can work directly into a power amplifier or a pair of active speakers, bypassing the need (and let’s not forget additional cost) for a separate preamp. Burmester’s products tend to sit at the very top-end of the market in terms of price, but they’re invariably well made and engineered to last decades. Importantly, the brand is happy to support these units for years after they’ve been made, which is reassuring considering their eye-watering price tags. The 089 certainly lives up to the company’s reputation. It weighs in at a hefty 13kg, which is more than most integrated amplifiers. That trademark chrome finish may not be to all tastes but there’s no denying its quality or the overall attention to detail. All the controls, including the large remote handset feel robust and precise. Our only complaint is the handset’s buttons are pretty closely packed and identically sized, making it a little harder to use than ideal. Its generous size means using it is a two-handed operation for most people. The main unit’s front panel display is clear, too. It’s relatively simple, keeping to just the basics in terms of information, but it can still be read from the other side of a brightly lit room. Take a look inside that lovely casework and you’ll find many interesting engineering touches. The 089 is that rare thing, a belt-driven CD player – most CD players are direct drive where the centre spindle is connected to the motor. The idea behind belt drive is that any vibration from the motor is isolated away from the disc and laser, improving the laser’s ability to pick information up. The whole transport is also isolated from external interference by sitting in its own low-resonance chamber. The aim, again, is to make the laser’s life easier by minimising the amount of external disturbances it has to cope with. Burmester has traditionally favoured balanced circuit design and this product is no different, and it starts right from the DAC stage and continues through to the output terminals. The company also doesn’t like to use capacitors in the signal path, claiming a reduction of distortion as the prime benefit. Great care is taken with the analogue output section- it’s the same X-Amp 2 modules as used on the brand’s top-end preamps. There are four digital inputs on our MMI equipped review sample: 24-bit/192kHz USB, optical and coax alongside Bluetooth. A balanced XLR analogue input makes the 089 more versatile in a system context, particularly if the player is configured as a preamp too. There are both balanced and single-ended analogue outputs alongside a single-ended record out. A product of this type needs a suitably talented system to shine. We used our reference set-up of Gamut D3i/D200i pre/power, ATC SCM50 speakers along with Naim’s NDS/555PS streamer and a MacBook Air loaded with Pure Music software as the digital sources. On the whole this system worked very well. We used the 089 both with and without an external preamp. There are certainly (slight) gains in outright transparency and resolution when used directly into our Gamut power amplifier, but also losses in terms of drive and authority. We decided to keep our reference D3i preamp in the system for the bulk of the test sessions. Once up and running, the 089 is a hugely impressive performer. With a unit like this we would normally start with CD replay, but here we’re intrigued by its Bluetooth capability. Such a connection is usually far too compromised for traditional high-end enthusiasts, and with Burmester charging a hefty sum for the MMI module, we want to know whether is worth it. We’re pleased to report it is. We used a Sony Xperia Z3 Compact as source and the results are impressive. The sound is smooth and free of the slightly hazy, unsubtle quality Bluetooth still suffers from in many applications. Listening to Here’s The Tender Coming from The Unthanks, we’re greeted by a refined, large-scale presentation that brims with finesse – it’s hard to believe Bluetooth has anything to do with the music transfer. There’s a good amount of insight and an admirable degree of dynamic expression. The group’s vocals come through with just the right degree of warmth, solidity and plenty of passion. The MMI module also adds USB capability. There are two settings here: the Class 1 option is limited to 24-bit/96kHz input signals but should work with a wider range of sources; Class 2 takes that upper resolution limit to 24-bit/192kHz, but will require specific software drivers for non-Apple computers. As expected, USB improves on Bluetooth, taking the already pleasing sound to a higher plane – everything just sounds more precise and under control. It’s a similarly positive story through both the standard optical and coax inputs. The 089 really has a talented DAC section, delivering excellent results when fed with something as capable as our Naim NDS/555PS streamer. The CD section is excellent. We listen to a range of music from Stravinsky’s The Rite of Spring and Leonard Cohen’s Popular Problems all the way through to Eminem’s Recovery and we love what we hear. The 089 is subtle when it needs to be, delivering low-level details with delicacy. It’s wonderfully organised too, managing to keep a multitude of instrumental strands audible and easy to follow no matter how complex the music gets. There’s also plenty of muscle here. The huge dynamic swings of the Stravinsky piece are punched out with venom, authority and no sense of strain. The Burmester’s stereo imaging is terrific. It combines an expansive and stable soundstage with precisely located instruments. The presentation is nicely layered and conveys a good sense of depth too. Something not always a given. Tonally, the 089 is every inch a Burmester, delivering a smooth, slightly rich sound without sacrificing too much bite or attack. It’s the kind of balance that is forgiving of a poor or harsh recording, without affecting the overall transparency. Such is the insight on offer that a good recording will always shine through. Burmester has never been afraid to hang hefty price tags on its products and the 089 is no different. There’s plenty of substance and ability here too, and certainly enough to earn a warm recommendation even at this price.